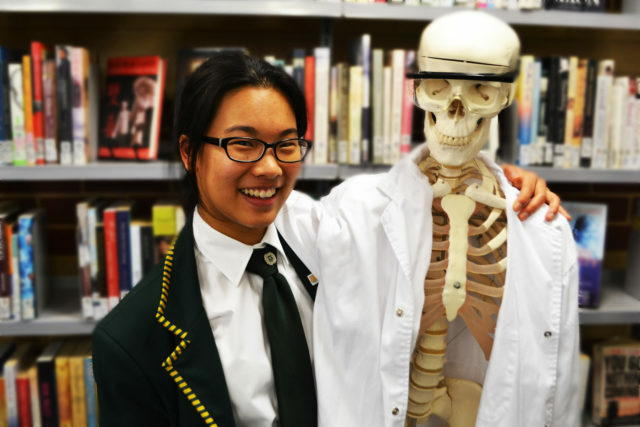 2013 Dux Emma Lu was taken aback by her Australian Tertiary Admissions Ranking, not because she did badly but because she scored the top mark possible, 99.95. "I can truly say I exceeded my expectations," said the vibrant Collegian. "I wasn't expecting to get 99.95. So then to get that score and to get a General Exhibition, I was just over the moon." That wasn't the extent of the surprise. Emma also received a Certificate of Distinction for Literature, the subject she considered her weakest. "I'm more of a sciency person. Literature was a different sort of subject to give me a break from all of the Science, Maths, equations, from Chemistry and Physics, so a Certificate of Distinction in that, I was like 'Oh my gosh'," Emma said. "To be honest, my parents are kind of in shock, quite surprised." Unexpectedly, one of Emma's best subjects at school turned out to be Emma's lowest scoring in the WACE exams. "Scaling is just so unpredictable, so Maths ended up being my worst and Lit was in my top four along with Japanese which I did in Year 11, Specialist Maths and Chemistry. "I struggled in Specialist Maths throughout the year. It was a very tough subject and I had to work very hard for it. I was definitely not expecting it to be in my top four so I guess it was also quite unexpected in that sense." Before the university placement offers for 2014 had been made, Emma travelled to Melbourne for interviews at universities but opted to stay in Perth where she has started her Bachelor of Philosophy with an assured pathway to Medicine at the University of Western Australia where many of her cohort are also studying this year. "I ended up having many, many different applications out there and I've been deciding whether to go to Melbourne or UWA. I eventually decided UWA because everything is here for me, all my friends and family," she said. "The main reason I wanted to go to Melbourne was so that I could have the independence, but I think the B Phil was just too good of an opportunity to pass up." As the 2013 Academic Prefect, Emma was at the forefront of raising the profile of debating at MLC. She advises every student to take advantage of the opportunities that they are offered at the College. "MLC has given me so many different experiences over my six years there. I've had the chance to go on music tour, maths camps, the Japan exchange, different leadership roles, co-curricular activities, all these different opportunities that were presented to me and I like to think that I made the most of them," Emma said. "I think school, especially MLC, is so much more than just learning the academic course work. It's also about trying out all your different interests, finding out what you're good at, maybe the things that you're not good at but you can still have fun at. Surprise yourself, definitely." Emma's next challenge is passing her driver's licence test, but there's a hitch. "At the moment my parents are too scared to get in the car with me so I have to find a driving instructor first."